Even though there are many different social media networks, the core practices and tenets of attracting audiences remains quite similar across all of them. On social media, people generally want to be entertained in some fashion. For some, this means information. For others, it may mean humorous videos or breathtaking photography. Whatever the case, every brand must find a way to mesh its mission with these elements. The number of likes someone has on social media is not just a matter of bragging rights, but also an indicator of reach and influence. In short, it has tangible value. Below, we’ll discuss three simple tricks that can boost likes on any and all social media networks. Whether it seems intuitive or not, people generally want to be asked to do something on social media. If you make a wishy-washy statement about how someone can contribute here or sign-up there, then the reception isn’t going to be very good. Strong, bold calls to action, however, can have a dramatic effect on an audience and generate a massive amount of likes for your brand. You see it all the time on social media: “Like this if you [xxxxx], share this if you [xxxxx]”. The reason this is seen so often is because it works! 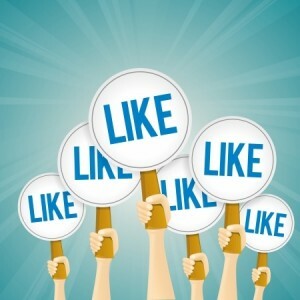 Likes and shares both help with visibility, but obtaining likes directly for your brand (as well as for individual posts) tend to be easier to obtain. Disclaimer: some social media networks are a bit picky about using this approach in paid advertising, so be sure to read terms and conditions before pinging URLs via paid campaigns while using this approach. Social media networks such as Facebook have a fairly uniform look. As users scroll through their status feeds, bland text looks the same – boring. It’s hard to make it stick out among all of the photos and videos being shared, which is why if you cannot beat them, join them! A picture really is worth a thousand words on Facebook, Twitter and other platforms. If you have doubt, then take a short message you were planning to post on social media, open an image editing program, create a simple image background with bright colours and text (using the same message you were planning to post), and then share it through this method. Compare its performance to similar messages published in text-only format, and you’ll see the difference in likes. Pinging URLs on social media to content from your website? While people will generally read the text on sites such as Facebook that appear above the content, their eyes will initially be drawn to the featured content – and primarily, what it says. We’ve all seen plenty of examples on social media of what we know as clickbait (“You Won’t Believe What Happens Next” is a popular example). These eye-grabbing and intriguing headlines pull people in – not only do they lead to higher clickthrough rates, but they also have been shown to boost the number of likes a particular post will receive.